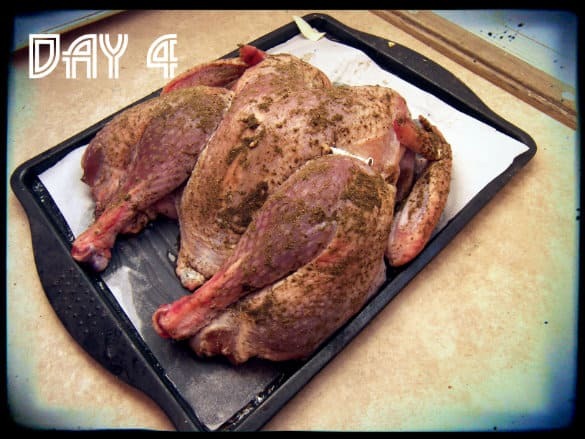 In November 2011 I watched with eager anticipation Alton Brown’s Countdown to T-Day. The Good Eats episode Romancing the Bird is a classic that influenced me so much in the kitchen. I really wanted to see what Alton came up with. 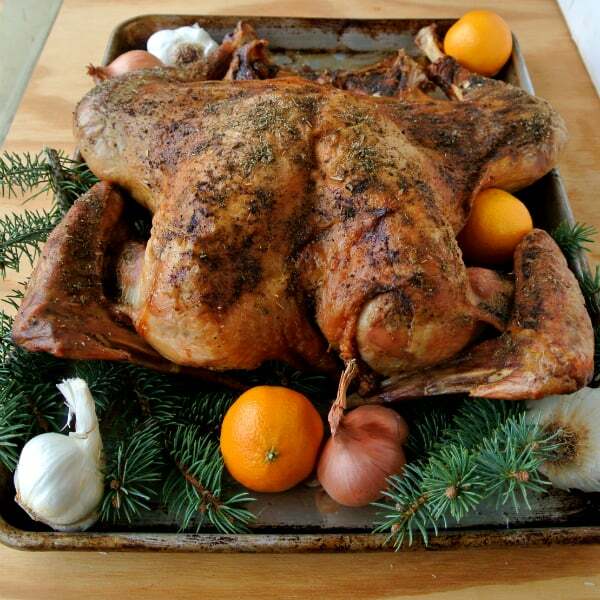 His original turkey recipe is beloved by so many. It’s the most commented recipe on all of Food Network’s website. How could you top that? Alton presented a new method. Unfortunately for me by the time I saw the episode I had no time to try it out before Thanksgiving. So I have been waiting an entire year to have my chance again and I took it the day that turkeys went on sale. 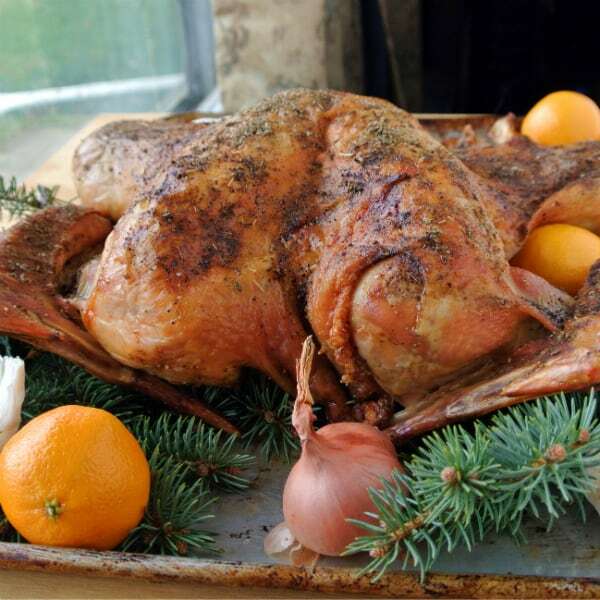 Why a Different Turkey Recipe? Alton identified some problems with the wet brined turkey. The skin doesn’t crisp up well, the drippings are too salty for gravy making, and if you brine it too long you end up with mushy meat. So how does one fix this problem. Get rid of the water. But without the water won’t the turkey become too dry? That is where the butterflying method comes in. By removing the back bone with shears or an electric knife (which is what I used) and flattening the bird out you can cook it faster. Below you will find my notes from this recipe. To print out the recipe, visit Food Network’s website. Yes it is strange the first time you bring this turkey to the Thanksgiving dinner table It’s shape will throw people off. But that crispy, brown skin, and how flavorful the meat is will make them forget what a traditionally cooked turkey looks like. 1. I purchased my 11-pound turkey on Sunday. My wife thawed it while I was at work that night. 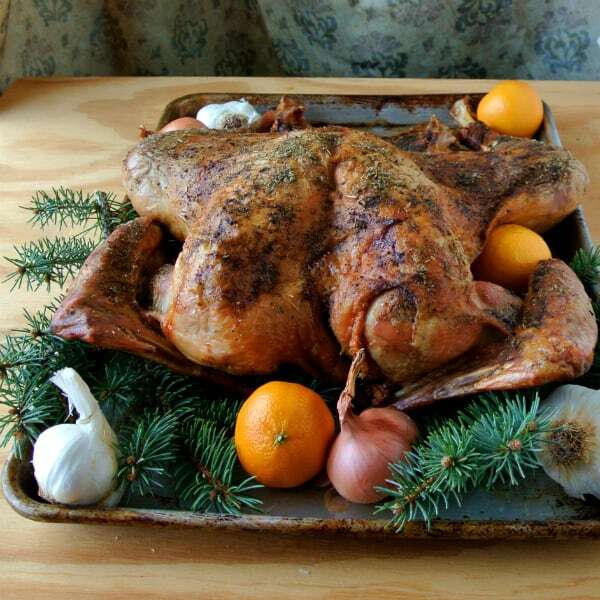 The turkey goes into cold water which you should change every 3 hours or so. Use a brick if the turkey floats, it needs to be fully submerged. The rate of defrosting is about 2 lbs every hour, so it took around 6 hours. 2. I made up the dry brine in my electric grinder. You want to try and find rubbed sage instead of the more powder stuff. It is more potent. It was made by rubbing the sage leaves through a mesh screen. I found some on sale same day I got the turkey. 3. Removing the back bone is never as easy as Alton makes it look (see the video I posted below). It took me a bit of struggle to get all the way through. I found the electric knife to do a good job. My kitchen shears are in need of sharpening. I saved the back bone along with the neck and giblets that I made stock with on the day I cooked the turkey (click here for my instructions on making gravy with giblet stock). Here is a video I filmed of my wife butterflying the turkey. 4. 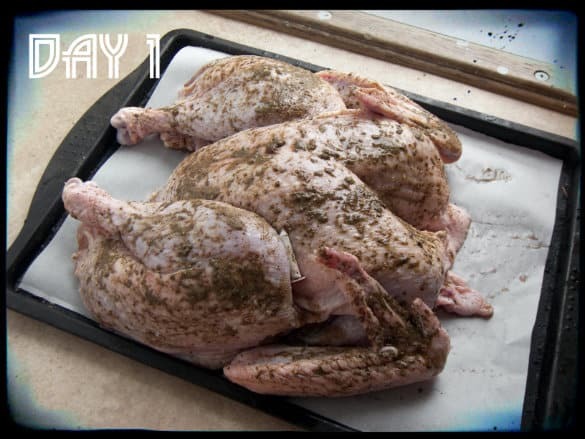 Try to distribute the dry brine as evenly as you can get it, on both sides. Use all of it, even if you think you don’t need to. If you have a bigger bird you may need to make more, just try and keep everything in proportion. 5. I am fortunate to have a good sized fridge so I managed to get it on in without touching anything. You are suppose to leave the turkey uncovered for 4 days. You don’t want moisture to build up underneath your covering. This is a kind of dry age method like top notch steakhouses do with their steaks. 6. Compare the two photos of the raw turkey. You can see the skin has dried out and appears more translucent. 7. To roast the turkey you place it directly on the oven rack. That may seem weird but there is a very good reason – panzanella. You place the roasting pan would have used for the turkey in the rack underneath it. It is filled with cubed root veggies. The drippings fall down onto the veggies adding flavor. 8. My turkey was done at right around 90 minutes, that is when the internal temperature reached 155 degrees (a probe thermometer is your best friend). Carry over heat brought it the perfect temperature of 165. I was excited to have nailed that temperature perfectly. 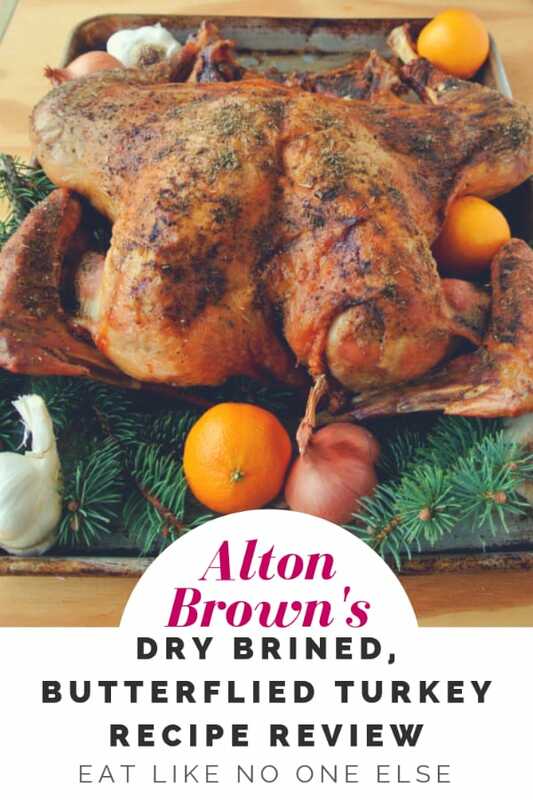 RELATED What Type of Turkey Would Alton Brown Buy? The meat was so juicy and flavorful, particularly the dark meat. Even the inner most part of the breast takes like the dried herbs. I also liked the ease of this recipe. The hardest part, the butterflying was done days before I had to cook. So when I was tired after working 8 hours it wasn’t too much trouble to cook the turkey. I will no doubt do this method again. It was worth the year of anticipation. Major kudos to Alton for not resting on his laurels and coming up with a new Thanksgiving hit! Alton Brown published a cookbook called Everyday Cook. In it he has yet one final turkey recipe. This one he cooks in a giant cast iron dutch oven. I don’t have one large enough to fit a turkey so I haven’t given it a try yet. This is really interesting! I think I may have to try this one out! Sounds super easy (which I love), quick and delicious. Thanks for sharing! Your Turkey looks wonderful. Im sure it was delicious. Did you have to baste it?? Or put butter before?? No need to baste or put butter on it. The skin was perfectly crisp and it was seasoned all the way through the meat. Your turkey does look wonderful – and I am happy to hear that you enjoyed it. THAT really makes me feel a little better now. Yes, I am making the same Dry-Brine recipe as you for our Christmas this year. I just checked on ours – whoa. Ha! 🙂 It’s been about 2 days – and my bird’s thighs and wings are red and the rest are still that white/pinkish skin color – but the skin feels dry. I was worried about going the whole four days. I do have a question – I’m not doing the veggies underneath – so, do you think cooking it in a rimmed cookie sheet on a rack so it won’t sit in it’s juices a good move? In my mind it works. The skin will seem to try out. Sounds normal. I have done this method many times now and has never had any problems. The skin is always super crisp and the meat is flavorful. Your idea to cook the turkey should work out. The veggies underneath are super tasty and I have also cooked dressing underneath too, but if you don’t want either, go ahead with your plan.